A 14-year-old adolescent girl was seen in her local acute care clinic for an ear infection and was noted to have thyromegaly. She was referred to your clinic for further evaluation. She reports some fatigue and cold intolerance, but admits that it is winter and she has been staying up late texting with her boyfriend. On exam, she has a thyroid that is twice normal size with no discrete nodules. Thyroid function tests show elevated TSH of 25 μIU/mL and mildly low free T4 of 0.7 ng/dL. The correct answer is “C.” Acquired hypothyroidism in the United States is most often caused by autoimmune thyroiditis, also known as Hashimoto thyroiditis. Iodine deficiency is the most common cause of hypothyroidism worldwide but is uncommon in North America because of iodine supplementation of salt. Thyroid cancer does not typically affect thyroid function. Children who are treated with radiation for tumors of the head and neck are at higher risk of hypothyroidism; this would be considered based on the history. 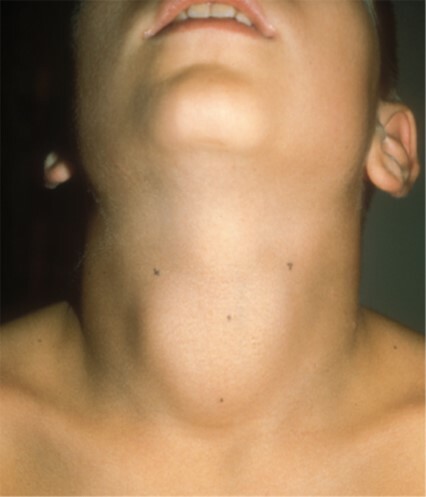 Congenital hypothyroidism is possible but would typically present before this age. Common symptoms of hypothyroidism in children include fatigue, cold intolerance, constipation, dry skin, and brittle hair. Signs of hypothyroidism include growth deceleration, bradycardia, facial puffiness, and delayed relaxation phase of deep tendon reflexes. There may be a small amount of weight gain (2–4 kg), although this is not typically severe. Photo: Kappy MS, Allen DB, Geffner ME. Pediatric Practice: Endocrinology, 2e; 2013.